So, we've finally made it home with everyone! Even Molly! 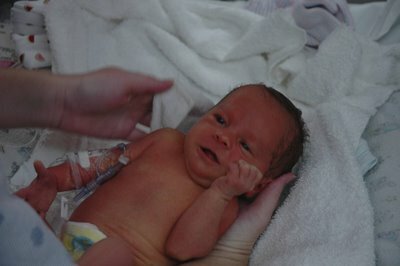 The discharge from the NICU was relatively painless. They made us watch a few videos on Infant CPR, how to use a car seat, and on shaken baby syndrome. Let me tell you, these were high quality productions. The car seat video especially was awesome. It was made in the late 80's and feature crash test videos of old Volvo station wagons with unrestrained kids in the wayback seats. Yeah, the cool rear-facing seats. So, that took an hour. Then the nurse told us that the NICU policy was that mom had to ride in a wheelchair to the hospital exit. 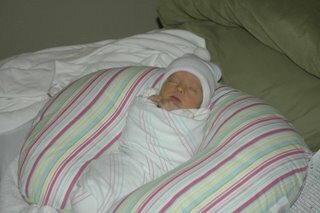 Now, our other child was carried from the hospital in her car seat just a few days earlier from a unit just outside the doors of the NICU. But, that's policy and policy trumps all. I left before they found a wheelchair cause I was going a bit stir crazy just trying to escape from the hospital. It's Thanksgiving morning! Anyway, we finally escaped and made our way home with Molly. Molly and McKenzie were allowed to get re-acquainted with one another on the couch. After their photo shoot was over, my mother-in-law made us a fabulous Thanksgiving dinner with turkey, dressing, mashed potatoes and sweet potatoes, bing cherry salad, and a bunch of other stuff. My parents came over to help us eat all the food. It was nice. Late this evening, my father-in-law and sister-in-law (with boyfriend) showed up after their day of family fun in Maryville. We took a lot more pictures and everyone got to hang out with both girls for the first time. We did discover one odd fact though. Molly has one attached earlobe and one detached. Most people are either attached or detached; she's both! Apparently, her aunt Jamie is similarly afflicted. 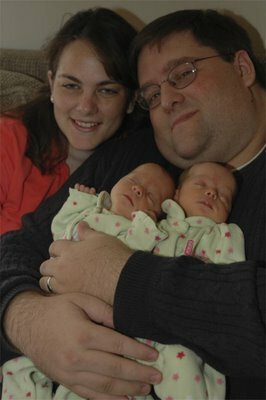 Tomorrow, we have Molly's first pediatrician appointment and McKenzie gets a weight check. Then we have another big dinner planned for my father-in-law's birthday. Yay! 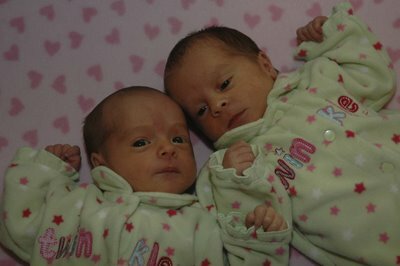 Here are a few more pictures to tide you all over until you can see the girls in person. I'd say that they are pretty cute but I'm biased. 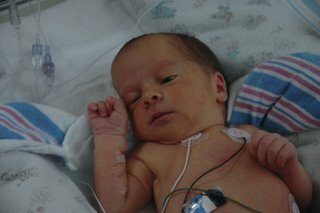 Today might be Molly's last day in the NICU! Yay! 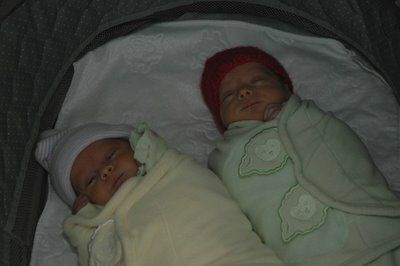 Finally, it looks like we're going to have both of our children at home with us by the end of the day on Thursday. All she has to do is keep her oxygen levels and heartbeat stable and we'll be good to go home. First though, let me tell you about last night. So, around 8:30 Tuesday night, we're chillin' around the house getting ready for bed and the phone rings. I answer and the person on the other end asks for "Mr. Sharpe". Yay, telemarketer. So, I say "you got him". 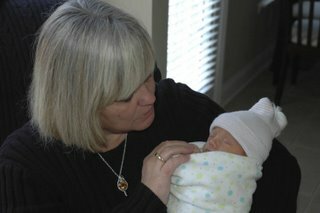 She says, "This is Kathy in the NICU. I don't want you to be alarmed but can I have your parent code?" Sidebar: when you have a kid in the NICU, you're assigned a 4 digit number as a "parent code". So, that way you can call in and get updates on your kid and they'll know it's you. When we were assigned our parent code, the nurse made a big deal about not telling anyone the code, not even the grandparents. I offered to sell it to my in-law's but I didn't get any takers. So, back to the story...I give her my parent code (FYI, it's ****). She then proceeds to tell me that Molly has been moved from Pod 3 to Pod 6 and she should be good to go home on Thursday. GOOD LORD WOMAN...you could have done that a bit differently instead of getting my mind racing as to what could be wrong. How about this next time..."Is this Molly's dad? Ok, just had an update about moving her around a bit...can I get you parent code? Ok cool..."
Ok, so Molly is doing great. She had her last IV removed on Tuesday night. We went to see her this afternoon and got to give her another bath (what the heck are these kids doing in there to need baths all the time?) and got her to breastfeed again. She's no longer on any sort of feeding restrictions so we're thinking maybe chicken nuggets for going home party? I don't know. I "got to" bathe her this time. Here are a few pictures to prove my worth. Here we are post bath getting dried off. After a bath and harassment from mom, it was time to eat some dinner. And now that we're all full, it was time to rest. So, the delays continue. Boo. 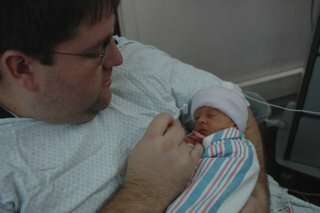 Went to see Molly at the NICU again this afternoon. First, the good news. She has now been able to fully regulate her temperature on her own so she was moved into a bassinet today instead of the warming beds. She also attempted to breastfeed this afternoon with some limited success. Now, the not so good news. 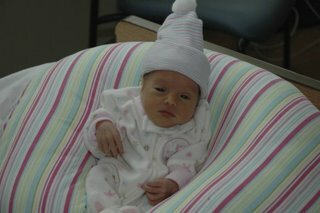 The doctor over the NICU this week, Dr. Blake, has determined that she needs to stay with them for a few more days. She's off all antibiotics and should be off her IV entirely by now but she had a bradycardia incident late Sunday night that he want's to make sure doesn't reoccur before she gets to go home. 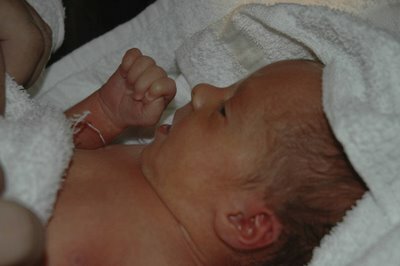 So, because of that, the earliest that Molly gets to leave the NICU is on Thursday. Happy Turkey Day! We also got a visit from Dr. Parsons, the pediatric cardiologist on call this week. Molly has a bit of an early heartbeat from time to time. These are called PVC's. Now, it's not a significant issue but it's yet another thing that needs to be checked and tracked. McKenzie had a pretty boring day. 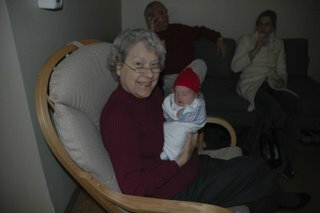 She got to hang out with us this morning and then grandma this afternoon. We got a call from Dr. Jeanie's office that we have an appointment with the neuro-specialist Dr. Oakes in Birmingham but they didn't tell us what the date was. Guess we'll need to call them back and get that. Random quote of the day: on the way home from the hospital, I saw a billboard that said "Beat the Bottle". It's on Amnicola and is an ad for alcohol addiction recovery. I said it out loud and then said that if you beat the bottle, I bet it would break. Lindsey then said..."Well, I bet it wouldn't break if you beat it with a q-tip!" It was a lot funnier in person. We had visits tonight from our friend Julie who brought us some great outfits for the girls. I'll get a picture posted soon. Also, uncle Michael and aunt Liza stopped by. We almost got Liza to try a poopy diaper change but she didn't quite come through for us. Oh well! My grandparents stopped by this afternoon and spent some quality time with McKenzie and my mother-in-law. They also brought some great meatball soup. Thanks! Also, big thanks to KW Downtown for the post-baby Baby Shower and Thanksgiving Lunch. Lindsey and I had a great time and appreciate the card, cake, and cash! No pictures today. Nobody did anything cute other than me and I don't like taking pictures of myself. So, Monday had a few firsts for both girls. 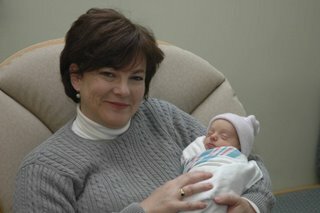 For McKenzie, it was time for her first pediatrician visit with Dr. Jeanie! 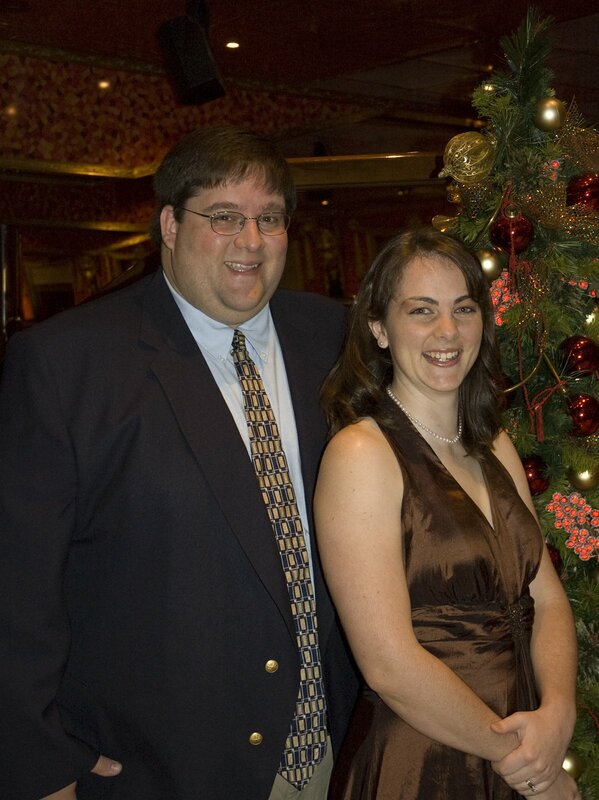 We've known Dr. Jeanie for a few years now through Camp Horizon. She has been extremely generous and has provided horses, ducks, chickens, dogs, sheep, etc for the kids who come to camp to experience. Horseback riding has long been one of the most popular activities at camp and Dr. Jeanie is the one who makes it happen! So, on to the visit. McKenzie is gaining her weight back. She was up to 5 pounds 5 ounces. She fed while we were there and gained 3 whole ounces! Dr. Jeanie called her an "efficient eater". I assume that is a good thing. Here's a picture of Dr. Jeanie examining McKenzie. The mirror makes it more fun. 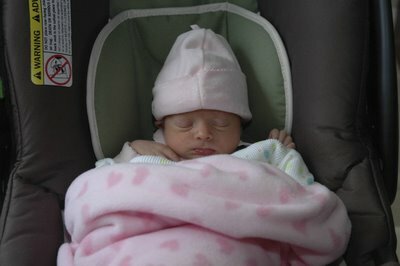 Here is McKenzie before we left the house all bundled up and ready to go in her car seat. That thing swallows her whole. For Molly, Monday was time for her first bath. Lindsey and I were lucky enough to be around to give it to her. She fussed a little bit but seemed to tolerate the process fairly well. Here's a picture of mommy cleaning her face and head. And here's one of Molly getting her first styling. Yes, that's a toothbrush. High class in the NICU I tell ya. Molly had some additional testing done yesterday for a possible irregular heartbeat. She had an EKG and an echo done to check out her heart. Structurally, everything looks perfect. All the valves and such are working perfectly. A lot of stuff we've read seems to indicate that between 3% and 60% of all newborns experience irregular heartbeats until they are 12 weeks old. Our theory is that we just happen to be hooked up to the monitors to where the doctors can actually see all this stuff and that it really isn't a big deal. Still, they decided to do a 24 hour holter monitor test on her to check her heart rhythms. That will be done by later Tuesday afternoon. She also should be done with her antibiotics this afternoon. Lindsey and I are on our way to the hospital now to see Molly. We hope that we can pin the doctor down and get a firm "release date" for Molly. Guess we'll see! So, day 2 of the home experiment kicked off today and things went well. Our popsicle maintained her temperature pretty well all day. The key to success is keeping your house at around 87 degrees. It's shorts and t-shirt weather around here. My electric bill is going to be huge! So, a few more pictures so everyone can see what has been going on. First, some of our visitors came back to town for the weekend, namely "Pops" John and aunt Jamie from Maryville. 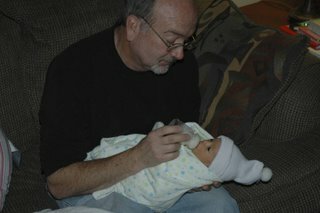 Here is Pops feeding McKenzie. G-daddy and Gigi also stopped by after church to see McKenzie at the house. Lindsey and I got to go to the NICU at Erlanger and see Molly again this afternoon. She was visited earlier by John and Sue. While they were there, Molly got taken off of her oxygen for the first time since she was born. She looks like she is doing great. The doctors won't commit to a date yet to when she will get to come home. She'll be done with her antibiotics on Tuesday but everything has to be perfect before she gets to leave. Both Lindsey and I got to hold her this time. 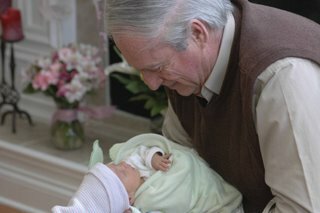 The NICU really tries to limit overstimulating the babies as much as possible so they can conserve energy to get better. 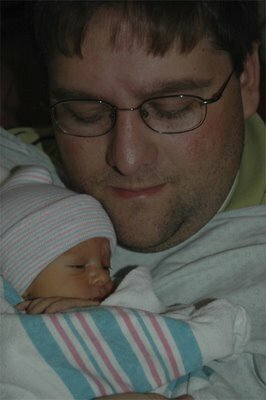 Lindsey had held her a few times but this was my first chance since in the delivery room on Monday. This is mommy and Molly after a bottle. So, what did we learn today? Well, I actually had a house showing this morning at 10am. 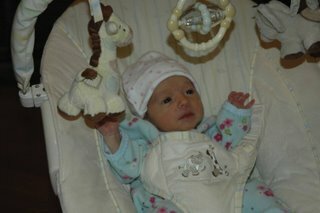 As I am getting ready to go, Lindsey expressed some concerns about McKenzie and her various "outputs" or lack thereof. So, we took her temperature and found out that she was basically a popsicle in footy pajamas (95.7 or so). So, that's not good. We bundle her up and I head out the door telling Lindsey that if push comes to shove, I'll only be 10 minutes away (more like 20, but whatever). At the end of the showing, my mother-in-law calls and says that the pediatrician has said if her temp isn't up to 97.5 in the next hour we'll get to visit the ER. Yay! More time at the hospital. So, what did we learn here? So, it was too cold in our house. The books told us that as long as mom and dad are comfortable, baby will be too. Well, not when baby weighs just a bit over 5 pounds. So, a few warm blankets and some quality snuggle time and all was well. As for Ms Molly, we haven't had an opportunity to see her yet today. 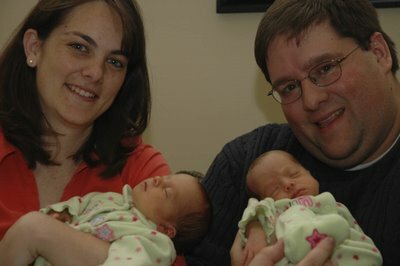 The NICU has open visitation anytime night or day except for between 6 and 8 am and pm for shift changes. But, the babies are only handled or touched during "hands-on time" every 3 hours. Molly is on an 8:30, 11:30, 2:30, 5:30 schedule for hands-on time. At 11:30, we had a frozen popsicle at home we were trying to thaw out. For the 2:30 and 5:30 times, the pod she is in has been closed (another child in the unit is having a procedure done so no one is allowed to come in). So, mom and I are slightly frustrated. But, one of the keys to the whole thing is to remain flexible. There is nothing we can change in the way the NICU runs or the needs of the other patients being met at a time that would be more convenient to us. That would kinda selfish of us. So, we're taught another lesson: this time, patience. Patience to realize that this brief moment away from our child is so tiny in the grand scheme of things even though it hurts so bad. Patience to see that we might need this time with only one child to better prepare ourselves for the onslaught of two newborns. Patience to see that Molly is as perfect as she can be so we don't have to worry and fret over her once she gets home. Patience to know that our family and our love is strong and enduring. So, we're now halfway home. McKenzie and mom were discharged from the hospital this afternoon and allowed to come home for, uh...forever, I guess. Molly is still in the NICU but we'll get to her in a minute. 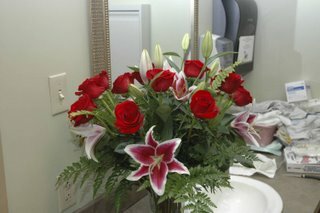 Unfortunately, due to all the post-delivery issues, the flowers beat Lindsey to the room by about 7 hours. Oh well, they smelled nice. Here are some pictures of her hanging out. 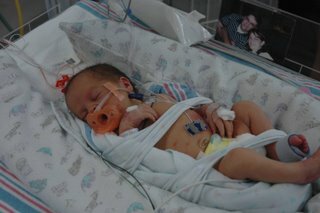 Molly is still in the NICU but has really been doing great. She has started to keep a lot of food down and her breathing is getting much more regular. She is much less swollen now than she was on Monday and Tuesday. We're still hoping for a discharge on Tuesday but the doctors say it depends on how much her chest clears by then and if she can learn to feed from a bottle well enough in order to go home. Hope she doesn't miss Turkey Day with the fam! 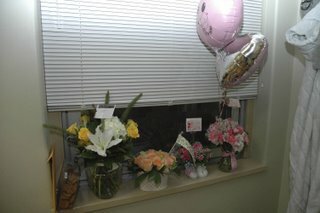 So, thanks for the support and prayers and visits and everything over the last 5 days. We've survived the birth and are now journeying into the just surviving stage. Yay! 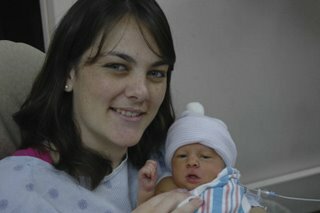 Here are the two girls together just before they left the delivery room. So, that's where we are. We'll be at Erlanger for a few more days if anyone wants to come and visit. Room 5039 at Erlanger Downtown! As the last step towards getting ready for the delivery, we went in to Erlanger and did our pre-delivery lab work and pre-registered for tomorrow. 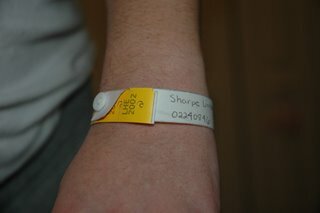 Lindsey got a cute bracelet to wear until she gets out of the hospital. So, that's it. We're all set to go now. We have to be at the hospital at 7am for a 9am procedure. Hopefully, there won't be any emergency procedures that bump us to a later time slot. We would love to see people over the next few days. We'll have 2 babies to share so there will be plenty of babies available to hold. So, here we are. 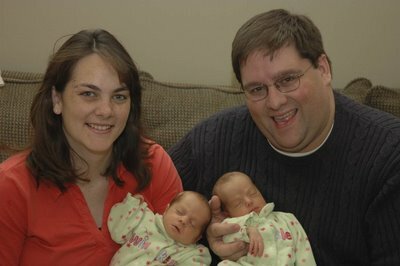 Today is November 14, 2008, and we are a mere 64 hours from the scheduled c-section to meet our twin girls. Anxious, excited, fear...the whole range of emotions are being experienced now. Nine months seems like such a long time but when the end draws close, it doesn't seem nearly long enough. So, this is a small blog site we setup to track and follow our family as it grows from 2 to 4 very quickly. We'll update it with pictures and commentary of what our new life is like. You, dear reader, will get to see just how witty I am at 3am after very little sleep. That's something you can look forward to!